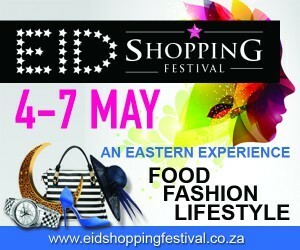 The EID SHOPPING FESTIVAL 2017 is set to take place in Johannesburg at the Ticketpro Dome FROM THE 4th-7th May. THE SHOPPING FESTIVAL in association with Gauteng Tourism , celebrates its 7th year with a FUSION of FASHION ,FOOD and LIFESTYLE inviting you to experience The Grandeur of the Middle East bringing with it an experience for the entire Family. Shop from over 10 countries in 300 Exclusive Stores, offering an ENVIGOURATING TASTE JOURNEY of Eastern and Indian Cuisine, a Treasure Trove of Trending Fashion and Accessories ranging from Leading Designer Brands and Kids Couture to International Fashion Lines. A stunning array of Gifts, Treats, Exclusive Home Décor,Patio , Appliances, Linen, Furniture, Design, Art, Hair, Beauty and Make up Brands. THE SHOPPING FESTIVAL 2017 is a leading high profile Event, encompassing a Culinary experience, Tasting, Food & Beverage Markets, Exotic Spices, Cookware, Crockery and Home Appliances.Join us and Experience the Shopping Wonders of the World, under the Dome, with over 40 000 visitors over the 4 day period. THE SHOPPING FESTIVAL as it presents an opportunity to bring together our Rainbow Nation, in the spirit of understanding and celebrating our various cultures. “Touch, taste and experiment above and beyond the collections itself. 2017 Trends are expressed through designer garments, fabrics, flavours and lifestyles in a life size experience that will appeal to all your senses. Set in a Middle eastern like theme, spicy fragrances, delicious foods, and simply magical encounters. “The EID SHOPPING FESTIVAL 2016 “The place to be”. Expect exciting fashion shows over the weekend highlighting the latest garments hot off the Catwalk. The Fashion Shows will bring together the season’s most iconic and original collections of Modest wear, showcasing the latest Fashion and Designers who will be displaying their creative signature and keep you up to speed with what’s trending in 2017. Indulge yourself in a Culinary Journey, whilst some of SA’s highly respected culinary Chefs share their cooking styles and recipes with you. 3 daily interactive cooking shows and informative talks will bring the excitement of a Master Chef show-down. A premium, secured and supervised FUN CITY, will provide a fun and educational environment during the festival where parents can register their kids to enjoy a fun filled experience set in over 1500m² of secured space to keep your little ones entertained. Complete with Gaming, Climbing Walls, Paintball Course, Rocket Station, Bungee Trampoline, Carousels, Jumping Castles, Arts & Crafts, Face Painters, sand art and Balloon Artists. With over 300 exclusive stores at your disposal, you are invited to Experience the Shopping Wonders of the world all under one roof. Shop for the likes of: Homeware; Décor; Hair; Health Products; Beauty Products; Make Up; Designer Clothing & Shoes; Eastern, Modest, and Western clothing; Financial Services; Jewelry , Perfumes, Spices and Delicious Food. Help us “Make a Difference” to those in need. Donate your gently used clothing, shoes and accessories to THE GHOOD FOUNDATION for the FREE Street Shop . We will set up a POP UP Store on the street, where the needy, destitute and orphaned will be invited to shop for an outfit of their choice FOR FREE, giving them a dignified shopping experience. The Street Shop will be held after The Shopping Festival @ The Oriental Plaza parking lot. Collection Drive @ The Eid Shopping Festival 2017.